Experience more enjoyable content on your Nintendo systems with this prepaid card eShop on the Nintendo Network. Choose from a variety of games, videos and more that download in seconds and can be played or viewed on your Nintendo Wii U or 3DS. 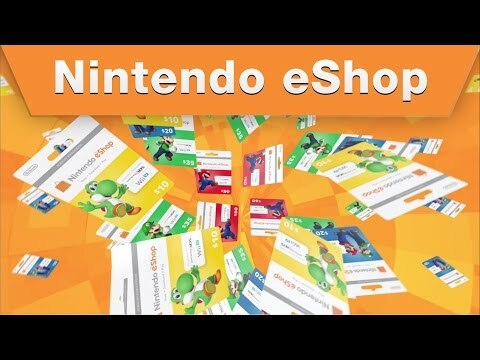 Nintendo eShop Card is a convenient way to virtually shop Nintendo stores. With this card you can safely and anonymously buy classic and new Nintendo games without using your credit card or bank account. The Nintendo Card is the perfect gift for anyone who loves to play. It’s easy - apply it to your Nintendo eShop account in seconds. It’s designed for security with your Nintendo eShop purchases - no credit card required. WARNING! This product is region locked and can be activated only in United States and can be used to buy digital games. Select the Nintendo eShop icon on the HOME menu. Select "Add Funds." or "Balance." Enter the 16-character activation code from the back of the prepaid card, then select "OK" to complete the transaction. Buy Nintendo eShop Gift Card - 10 USD - North America for 45,568.64 DXC?